Over 100 guests attended the annual Scottish National Party Constituency Burns Supper, held this year at Fraserburgh Leisure Centre. 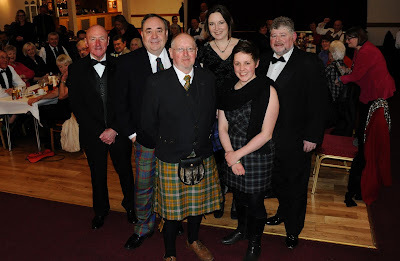 Former First Minister Alex Salmond MP was guest of honour and proposed the immortal memory. Banff & Buchan MP Dr Eilidh Whiteford chaired the evening’s proceedings, while Stewart Whyte proposed the Toast to the Lassies, which was replied to by Aberdeen North MP Kirsty Blackman. Recitations were provided throughout the evening from Aberdeenshire councillor and Doric enthusiast Cryle Shand and Sandy Noble gave the Address to the Haggis in fine style. “The turnout was excellent and was a great celebration of the life and work of our national bard, Robert Burns. A huge thank you to everyone involved in the organisation of the night and especially to our guest speakers from far and near.